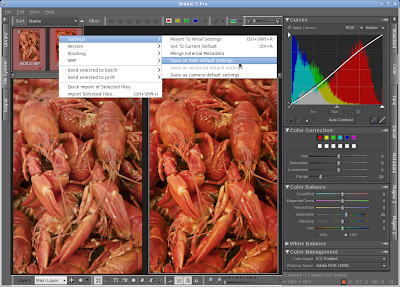 You can create a custom defined set of 'Default RAW settings' in Bibble 5. These default RAW settings are the ones that are automatically applied to every RAW file you open in Bibble for the first time. If you are using Nikons software (similar goes for Canons, I guess...), your in-camera settings for sharpening, color saturation and the like will be reflected on screen immediately. Now what Bibble does is completely different. Seems that all you get from camera by default here is the pixel values and white balance, which in many cases looks nothing like the picture on your cameras LCD. It just turns out quite dull and boring actually. The good thing is that a much better looking photo is just around the corner! Two things that I have been doing 99% of times after opening a new picture for editing was to first adjust curves to a slight 'S' and then increase saturation. So both of these adjustments were added to the Default RAW settings. The S curve as you see it down in the screenshot below, and saturation set to 15. When you adjust these settings, right-click on the picture thumbnail, choose Settings and then 'Save as RAW Default Settings...'. Obviously the exact settings need to be custom tailored for every photo. Usually saturation value goes down to 10 if it is a portrait I am working on or it could go up to 20 if it is a nature shot of some kind. You might have noticed that in the above screenshot the Working Space is set to Adobe RGB. That is also included in my default kit, but this one is up for everyones own taste... Just like any other setting too. If you are doing any other adjustment to almost all of your pictures, might as well save it into your own defaults. How to crop in Bibble?